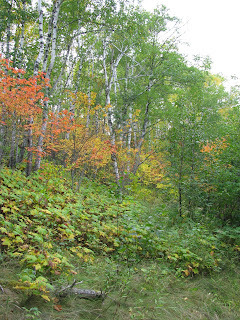 Friday morning, after a hearty breakfast which may have included scrambled eggs, hash browns, bacon, French press coffee and blueberry, cranberry, wild rice pancakes, we packed up and left the hotel with The View and headed for one of our favorite Minnesota state parks. 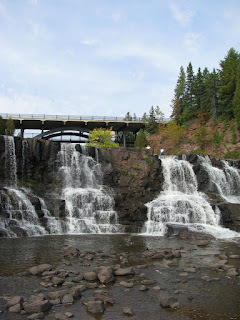 Gooseberry Falls State Park is known for its spectacular waterfalls. And for good reason. I just realized you can see the rainbow created from all the spray in the picture below. 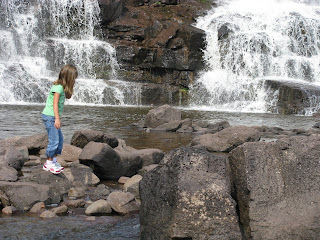 Adding to the allure -- rock croppings in the middle of the falls are very accessible. Especially if you're a seven-year-old daredevil. 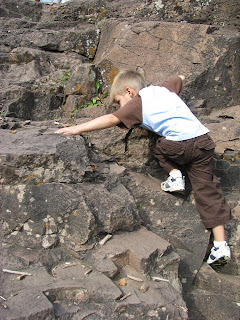 Or a four-year-old rock climber. You can even get near the edge of one of the falls and peer down into the depths. 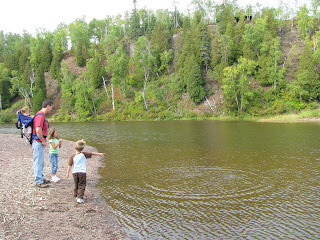 It's also our favorite place to hike with small children, thanks to a fairly easy stretch of trail that winds out to Lake Superior. 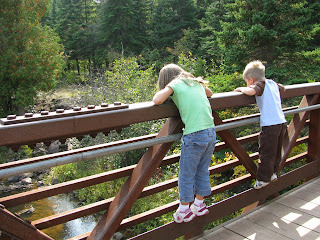 Our first stop was at this bridge, where the kids played Pooh Sticks. 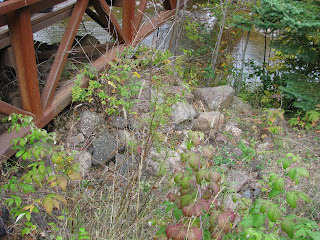 The first round was a wash, since they dropped their twigs off the downstream side of the bridge. They were hunting for another set of sticks when Corey started shouting, "Kelly! Kelly! Come here! Quick!" Being an obedient, submissive wife, I ambled over rushed to his side. Can't see it? How about if i zoom in? See it now? No? Want a close-up shot? Wait! Come back! 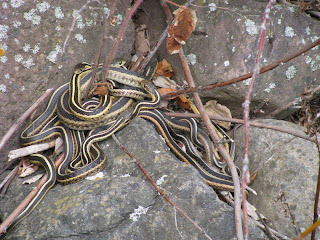 It's just a picture of eight garter snakes tangled together next to their den. Which was right under the bridge on which we were standing. I know. It gave me the willies too. Corey, on the other hand, was so excited he could barely stand still. (He's pretty much an Asian Jeff Corwin.) Which is why I now have 20 pictures of garter snakes on my computer. 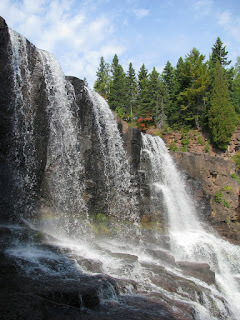 Later, we found out that naturalists who've worked at Gooseberry Falls for more than a decade have never seen that many snakes together at the park. It's uncommon. And, I might add, freaky. Once Corey was able to regain his composure, we scooted on by the snakes and continued our hike. 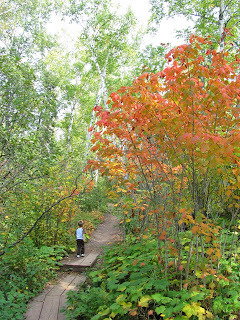 The fall leaves soothed my heebie-jeebied spirit. Ahhhh. That feels better now, doesn't it? 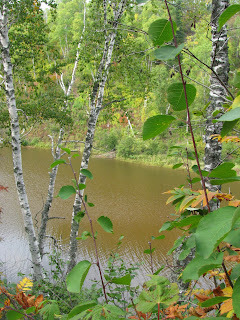 I love the birch trees Up North. 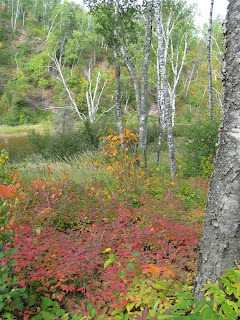 Eventually, we made it to our destination -- the place where Gooseberry River flows into Lake Superior. For the record, the kids alternated between having fun and being complete whiners. Except for Teyla. 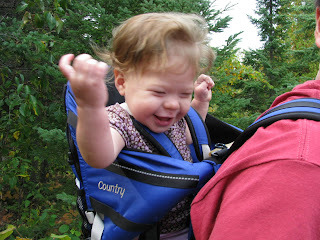 She loved being in the backpack. She shrieked and raised her arms and banged on Corey's back and grabbed at leaves. "New input!" On the return trip, Connor and I spent part of the time jogging ahead of Corey and the girls. Connor's favorite thing to do lately, besides play Legos, is find sticks that look like guns and fight the "bad guys." So he and I were both equipped with driftwood weaponry and jogging down the path, shooting imaginary villains, when suddenly I yelled, "Connor! Stop!" To his credit, he did, immediately. 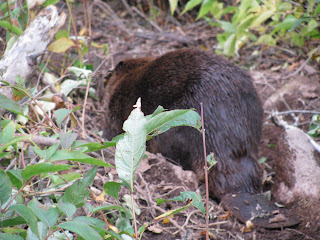 Which is a good thing, because he was about two feet from plowing into a beaver. Poor fat thing, he was just as startled as we were. He was sitting right next to his slide, which a park ranger had pointed out to us on the first leg of our trip. 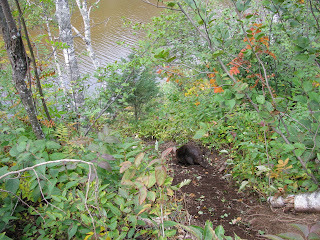 It was empty at the time, but the ranger somewhat guiltily admitted that he had almost stepped on the beaver earlier that day, since Mr. Beaver was busy tearing up aspen at the top of the hill, dragging it down his slide and then transporting it to his house across the river. And that's just what he was doing when we (almost) ran into him. We backed up a few feet, to give him some space, and then watched as he slowly continued on down the slide, stopping a few feet from the path to grab a small aspen tree and drag it with him. 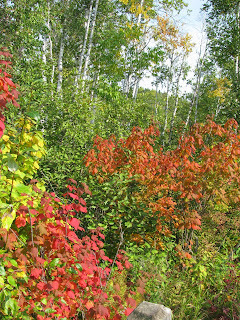 The rest of our hike was uneventful, if you consider amazing fall color uneventful. The amazing thing is: That wasn't the most exciting hike of our weekend. Well, OK. Maybe it was. But it wasn't the most scenic. More to come (INCLUDING A VIDEO) tomorrow. Ew. You need a warning at the top of the post about snake photos. I wasn't prepared. And if that video is of snakes tomorrow, we may be finished. :-) blech. Except the snakes. Not so pretty there. I don't know if I could have kept going after seeing those snakes...I'd be afraid there were more lurking along the trail. Your kids sound like mine. Mine alternate between whining and having fun ALL the time. I much prefer the having fun part! Great pics...glad you had that time together. Two words: EEEEW! and Beautiful! that was an amazing hike! what interesting things you got to see. the pile of snakes was incredible. What an AWESOME day you had! I'm so glad you posted tons of pics. And your kids are like mine--they whine a lot but somehow manage to have a good time scampering everywhere and into everything (and they still aren't too old for Poohsticks). And I want some of that breakfast, too! that's a whole lot of snakes at one time. Teyla's face tells the whole story from her eyes. LOVELY. Beautiful! And snakes don't even make me flinch. It looks like HERE, actually. With good reason, I might add. OK, I did NOT expect snakes to be your wildlife. Girl, I thought we left the snakes in CA! But, oh man, that scenery is just GOR-GEOUS. 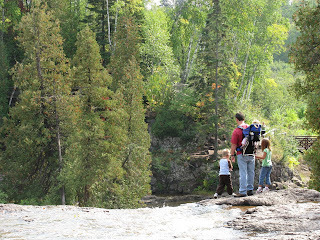 The pictures of the scenery and your family are gorgeous. The snakes...well, I'm sure they are beautiful if you like snakes. EWWW. I am aching for home right now. Sincerely aching. 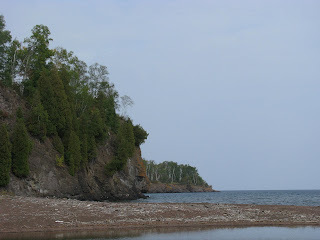 We took our canoe out on the lake for dinner last night, but it was drizzley and over cast and not at all uninhabited...Oh how I wish I could be where YOU are! love you, my friend! Kelly, I didn't realize how long it's been since I've been here. I love coming to visit you; I don't know why I'm having such a hard time keeping up with blogging. I guess it's because I work outside the home? I don't know, but it sure was good to see Teyla's growth and the beautiful pics of vacation. I was really touched by your notes on visiting your grandma. I hope that you are able to post a video tomorrow; I would absolutely love to see what you're saying. And maybe Teyla! So fun! The snakes are crazy. Holy cow! First of all what a breakfast! Photos were great except the snake one about did me in....Beautiful place! Looks like a great time! Especially all the outdoors while staying in a hotel :) I do like camping but it's so much work! Love all of your pictures, and the stories. Crazy snakes! uck so glad you were on top of the bridge! Great pictures! I don't think you ever need to apologize for the length of a post; it's your own blog, after all! 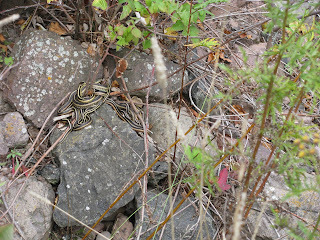 And I was fascinated to see the snakes, since I wasn't actually physically close to them. But Garter snakes are totally harmless, right? That's what I've always heard. 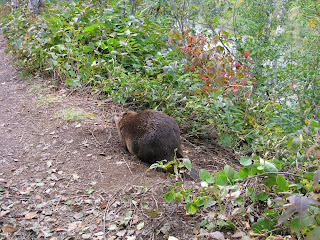 The beaver was very cute, as well! What a beautiful place! Minus the tangled wad of snakes, of course. The snakes...I'm trying to forget them...it's not working so well. How beautiful! Well, not the snakes. Makes me want to hit the nature trail or something outdoorsy like that. And then I remember the snakes. Your photos are incredible, and so are the events of your trip! How fun!